Nissan has confirmed a more powerful GT-R for 2016. The twin-turbocharged V6 hypercar will now deliver a whopping 570PS and be capable of reaching a top speed of 200mph. The cabin has also been updated, with more leather and less buttons. 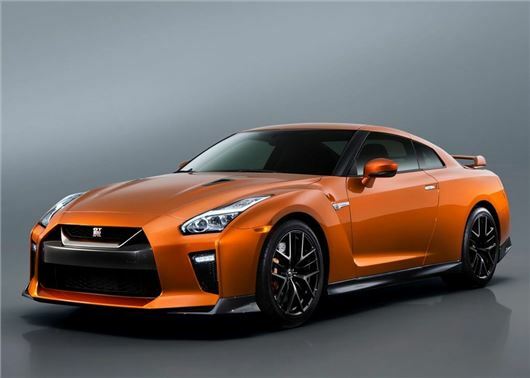 Expect the MY17 GT-R to cost £80,000+ when it reaches showrooms in September. Introduced back in 2007, the GT-R was subject to rumours that it was on the verge of being replaced with an all-new model in 2016, but Nissan has quashed this and given its sport car some slight improvements to keep it competitive. The GT-R's 3.8-litre twin-turbocharged V6 engine has been reworked to deliver 20PS more, while outright torque has upgraded to 637Nm. Nissan hasn't released any 0-62mph figures, but expect the more powerful GT-R to complete the sprint in 2.5 seconds. The six-speed sequential dual-clutch gearbox remains, but the ratios have been reengineered to provide smoother changes. The gear shift paddles have also been moved from the steering column to the wheel to make it easier to change without lifting a hand from the wheel. Inside the cabin gets more leather and a new eight-inch colour touchscreen, which will display everything from the in-built navigation to the Sony PlayStation derived G-Force counter. The interior also has less clutter, with the switch count cut from 27 to 11. New air vents, seats and trims have also been added to the cabin, along with a new centre controller for all of the infotainment actions. As with the previous-gen GT-R, the dashboard is covered in soft touch leather and flanked by circular air vents. Outside the GT-R gets some subtle updates, with a chrome matte V-motion grille and larger air vents dominating the front. The side sills have been pushed out to improve air flow over the car and the rear bumpers have been enlarged. A “Katsura Orange” with multi layered painting has been added to the exterior paint options list.